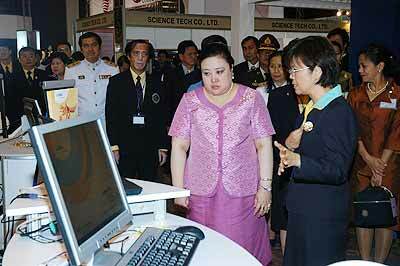 HRH Princess Somsawalee graciously presided over the annual academic symposium of the Associated Medical Science Association of Thailand held in Chiang Mai. On hand to welcome the Her Royal Highness to the exhibition held at the Lotus Pang Suan Kaew Hotel was Assoc Prof Dr Ratchana Sarntinond, the Association President. Dr. Philip John Parry, Ms. Chinarat Nakhasathien, Mrs. Rita Holm Gustafsson, board member of Kids Ark Foundation and Mrs. Supajee Nilubol, Honorary Consul of Sweden in Chiang Mai at the recent opening of the handicraft shop. Kids Ark Foundation opened their Handicraft and Textile showroom which are made by Lahu villagers to raise money for children who have been affected by HIV. “Our major sponsors for the Foundation are the Queen of Sweden, Kids Future, World Childhood Foundation and help from the private sector of which 80% are from overseas and 20% are local Thai people. We provide a god parent program and a ‘house of hope’ in each school in Chiang Mai where Kids Ark operates so that it will give students a clean and safe shelter to study” said Rita Holm Gustafsson, a board member of Kids Ark Foundation. Kids Ark Thailand is a registered non-profit organization committed to helping children in need in Chiang Mai whose parents have died from HIV. 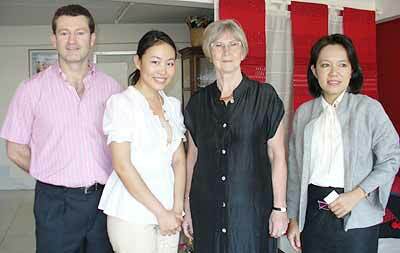 The foundation was set up by Allan Gustafsson and Rita Holm Gustafsson from Sweden in 2000 and Dr. Chao Duangduen Na Chiang Mai is the Chairlady of the foundation. Now supporting 260 children their help continues as a large number of orphaned children decide to drop out of school. The Chiang Mai Expats Club held its regular meeting on the 28th of April with a presentation of Christopher G. Moore latest work titled “The Risk of infidelity Index” which is the ninth in his Vincent Calvino series set in Bangkok. Alan Hall, President of the CEC, author Christopher G. Moore with his latest book “The Risk of infidelity Index” and Busakorn Suriyasarn his wife. 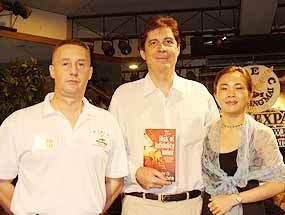 Christopher G. Moore is a well known English author who writes about Thailand and Southeast Asia. His books have done very well in America, Australia, Europe, and Japan. His 17 novels have been extensively reviewed in Newsweek, Maclean’s, The Globe and Mail, Vancouver Sun, Asia Times, Japan Times, various media in Europe, and the Bangkok Post and The Nation. The International Hotel and Tourism Industry Management School (I-TIM) is now accepting applications for its 39th intake which will commence in July. Scholarships are available with scholarships for financial need reserved for Thais only and scholarships for excellent students open to all nationalities. I-TIM offers a two-year diploma in Hotel and Tourism Management and a one-year certificate in Hotel and Tourism Operations. Each year includes an internship period in all major tourist destinations in Thailand, including Chiang Mai and extended overseas salaried internships are available in the second year of the diploma program. For more information please visit www.i-tim.ac.th or telephone (66) 02-7320170-3 # 201-207. ComPeung is the first non-governmental artist-in-residence program in Thailand. Founded in 2005 by art professionals who strongly believe places that defy the mainstream art’s “obsession” with commerce rather than content are needed. Alternative places that experiment with and questioning the role of art, artists’ positions, and the interdependence of art and society. ComPeung aspires to be one of these places, open to all who share the seriousness and the compassion for creativity. Located just outside of Chiang Mai (Doi Saket) with its ever growing vibrant art scene and many facets of alternative lifestyles, ComPeung, a nonprofit organization invites interested artists and content providers to submit their proposals for a residency at the home. We also welcome collaborative ideas, suggestions and proposals for future collaborations as well as constructive feedback and comments. Myanmar’s (also known as Burma) regime has done its best (or worst) to isolate the country from the civilized world, but it has been unable to block the search by free-thinking Burmese artists to link up with the progressive forces at work beyond their geographical borders. The outstanding Burmese sculptor Sonny Nyein is a living example of the power of individual creative energy to resist official repression—and an exhibition of his work that opens in Chiang Mai on Saturday May 5 provides vivid proof of this. The sculptures on show are as innovative and modern as anything to be seen in the leading galleries of the West. They afford a delightful surprise for anyone who still believes that Burmese art is dominated by tradition and conformity. Born in Mandalay in 1949 and a graduate of Rangoon’s School of Fine Arts, Sonny Nyein became absorbed early on by Burma’s small but vibrant modern art movement. A tour of the United States in 1993 brought him into direct contact with American contemporary art and artists, and on his return his work acquired a heightened awareness of the world of ideas outside his native Burma. “Sonny Nyein expertly combines traditional sculpture with an avant-garde sensibility to create artwork that has tremendous power and poetry,” wrote the influential American sculptor and academic Robert Roesch. The exhibition of Sonny Nyein’s work, “Contemporary Sculptures of Myanmar,” runs through May 26 at Chiang Mai’s Suvannabhumi art gallery. The exhibition is open daily 9am-6pm. The address of the Suvannabhumi art gallery is: 9/10 Taewarit Road, Chiang Puak (off the Superhighway), tel. 081/0315309. The Ministry of Public Health is on full alert to prevent the spread of dengue fever after the disease claimed four people’s lives so far this year, and the number of dengue fever patients nationwide has risen to 6,000. The focus of the outbreak is in Trat province, 400 km southeast of Bangkok on the Cambodian border, and in the southernmost provinces along the Malaysian border. Trat has almost five times the frequency of the disease — 46 patients per 100,000 compared to the national average of 10 per 100,000, according to Public Health Minister Mongkol Na Songkhla, while Pattani experences 42 per 100,000 and Yala has 33 per 100,000 residents. Earlier than usual rains has meant that dengue is a greater concern this year than before, Dr. Mongkol said. More breeding grounds for dengue-carrying mosquitoes emerge during the rainy season, he explained, especially in the three southernmost provinces where heavier rainfall contributes to a higher population of mosquitoes than in the country’s other regions. Cars painted in the three national colors of Thailand finished 1st, 2nd and 3rd in the Classic Cars of Lanna group’s first Treasure Hunt that took place last Sunday April 29th. Having collected all sorts of essential points-scoring items from empty snail shells to virgin coconuts, Adisak ‘Jimmy’ Yordpanya squealed and roared his 46 year old white Peugeot 404 around the final auto-test in record time to take first place by the finish line at the Wantarn Resort near Mae Kuang reservoir. Eddy’s Toyota Celica was in the workshop, so he navigated Jimmy to success on this historic occasion. In a close second place came the Italian racing red Alfa Romeo of David Hardcastle and Alex Boyesen, and the blue Mini 1000 of Kittiboon Sumantakun and Wiyada Hardcastle crossed the finish line in third. The easy route began from the Coffee Bus at Meechok Plaza on the Central Ring Road and took entrants north towards Mae Jo before swinging west to route 118. Only a few kilometers north and cars were out in the country leading to the reservoir, where most of the point-scoring items required by organizer Michael Madge could be found in the hedgerows or rural shops. For more information about Classic Cars of Lanna please contact Wiyada Hardcastle on 084 042 1591.